Posted on July 8, 2007 by Alicia Bay Laurel	in Blog and tagged travel diaries. 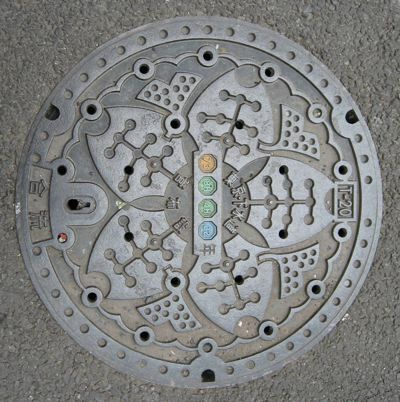 May 16, 2007, Tokyo. My first big change after turning 58 is that I begin to travel by train in Japan by myself, lack of language skills notwithstanding. Usually one of my friends studies the train schedules online, and hands me a paper telling me which trains to take and at what stations to change trains. If I don’t know how to get to the next train I’m supposed to take (some stations have dozens of platforms at different levels and cover several acres), I ask the officials working in the station to help me. In one particularly large station, the friendly young man in the office actually walked me to the correct platform, which took quite a while, going up elevators and across shopping areas where hundreds of people walked purposefully in all directions. He was happy to practice his English. It was sweet, and by no means a singular occurance. I met friendly and helpful people everywhere I went. First stop today was in the Chiyoda section of Tokyo, to meet for the first time the literary agent with whom I’ve been doing business for years by email. Isn’t she gorgeous? This is Miko Yamanouchi, director of Japan Uni Agency. 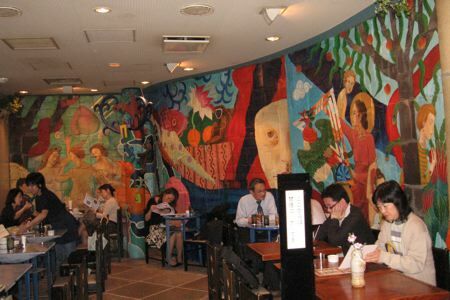 We met for tea in the Koseto Cafe, where the walls are covered by dramatic murals painted by a famous actress. I discuss with Miko my current projects. Her English is perfect, and no wonder, she’s off to New York, or London, or Sydney, at the drop of a hat. Next stop, I have a lunch date next with Setsuko Miura, my dear friend who produces television shows with an environmentalist viewpoint at TV Man Union. 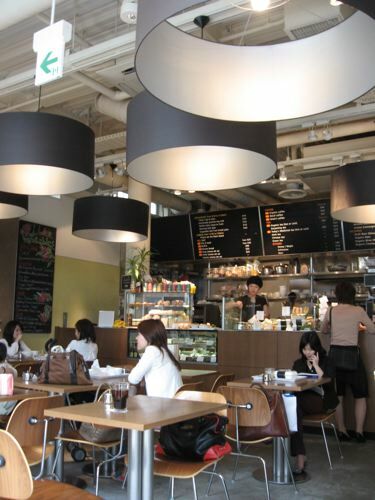 We dine at a very modern looking natural foods cafe in fashionable Shinjuku, near her office. I have come to her office to discuss the interview-documentary that she and her crew will be filming of me the following Sunday, while I am performing at the Natural High music festival at Doshi, at a mountain campground two hours drive from Tokyo. 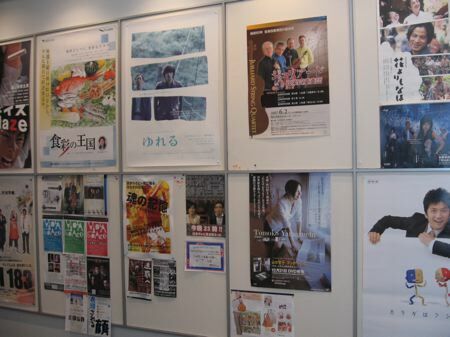 Colorful posters in the hall clue me to the wide variety of shows TV Man Union produces. 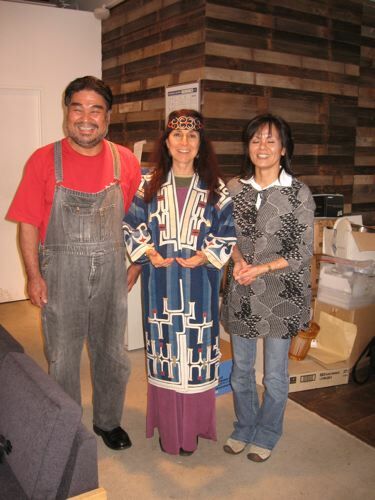 Sayaka Matsukawa, the director, (on the left, above) wants me to sing the songs from my first CD that have the most meaning to her: Hang Out and Breathe, and Pain and Love. I’m happy, of course, to oblige. She would like me to draw some line drawings typical of what I plan for the animated educational series for children on which I am working now. No problem. I always carry my pens. 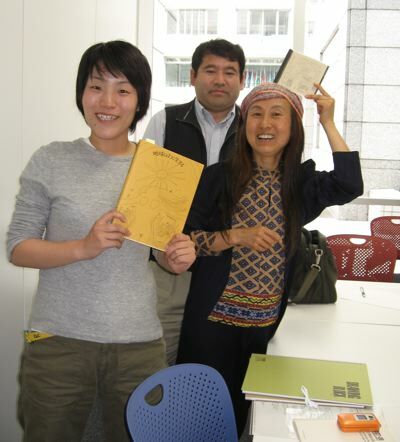 Mita Yutaka (center), the executive producer, mostly just listened as Sayaka and Setsuko unfolded the plans. 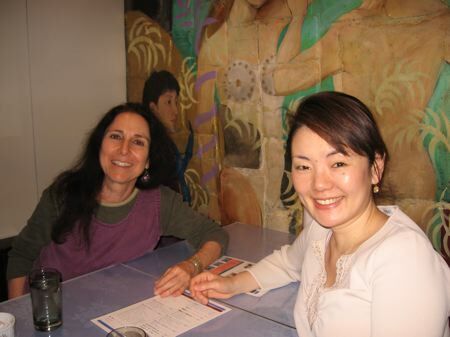 Setsuko, who lived in California in the ‘70’s, and no doubt studied English mightily, translated for me. Setsuko drew me a map so that I could walk to the Kurkku building from her office in about 45 minutes. 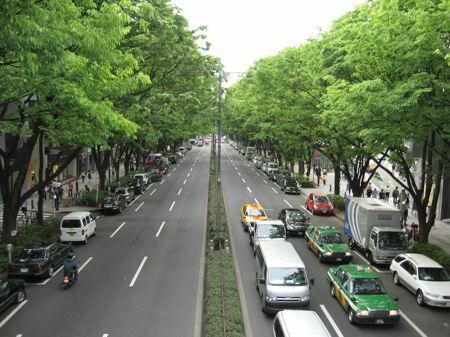 I took this photograph from a bridge over Omotesando, an elegant shopping street on the border of Shibuya and Shinjuku. 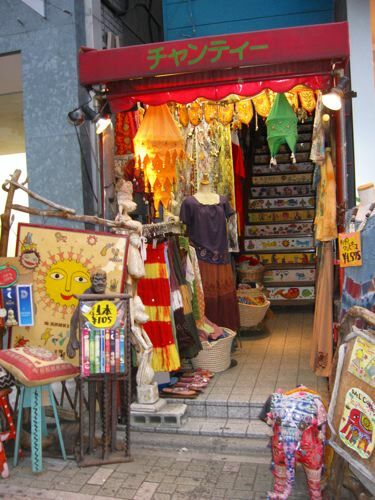 This part of Tokyo is full of trendy shops, and caters to young people especially. 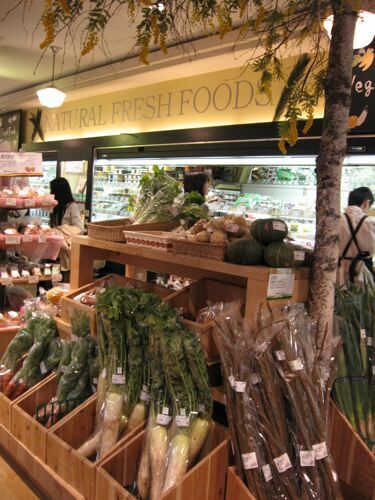 I stopped into a natural foods market, and marvelled at the mix of imported, familiar products and typical Japanese foods, grown and prepared without chemicals. In the bins nearest me are organically grown mizuma (delicate salad greens), daikon (giant radishes), gobo (burdock root), and negi (green onions). 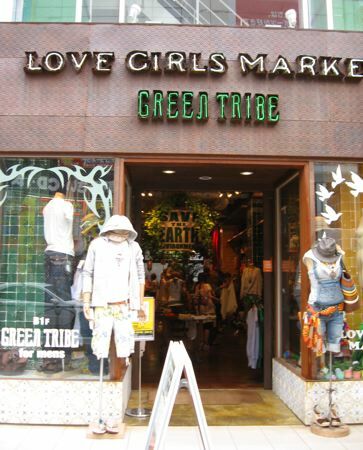 I passed a cute store selling “green” clothing (organic cotton, hemp, and other natural fibers). See the “Save the Earth” sign inside? Here’s what Kurkku’s compound looks like from the street. 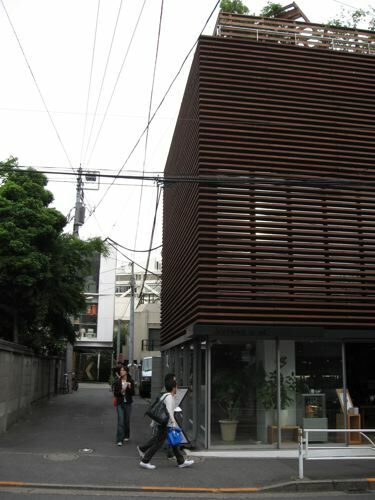 There’s a garden store on the first floor, a natural foods cafe on the second floor, and a garden on the roof. Down the alley is their other building, with an elegant natural foods restaurant on the first floor, a bookstore and a “green” store selling sustainably produced clothing and gifts on the second floor, and the Artist Power Bank offices on the third floor. Both buildings were built from recycled and sustainably produced materials. Last October I performed a concert and storytelling show in the bookstore. Next May I’ll do it again, as the opening of an art exhibit I’m having there. Artist Power Bank is an environmentalist arts notforprofit that runs Kurkku and funds community projects that raise awareness of sustainability and the environment. They sponsored my tour last October. 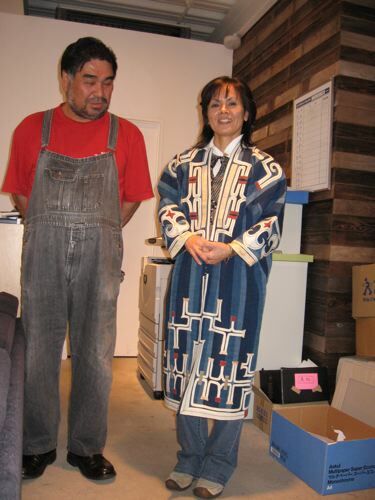 When I arrived at the office, two Ainu tribespeople were visiting from Hokkaido. The woman is a fashion designer who makes clothes using traditional folkwear designs from her culture, including the beautiful robe she is wearing. They insisted upon dressing me up in their clothing, and then instructed me in placing my hands in the proscribed mudra (hand position). I had a productive meeting with the Artist Power Bank and Kurkku staff regarding the upcoming Natural High festival and my participation in it. Several of my friends from last October are working with me on this event, including Kaori, the translator (second from left), and Keisuke Era, the project director (third from left). 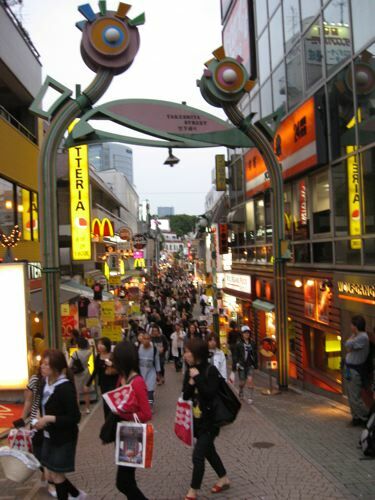 eeting, I walked to the Shibuya train station via Takeshita Street in Harajuku, the brightly lit shopping alley for college age and younger people. 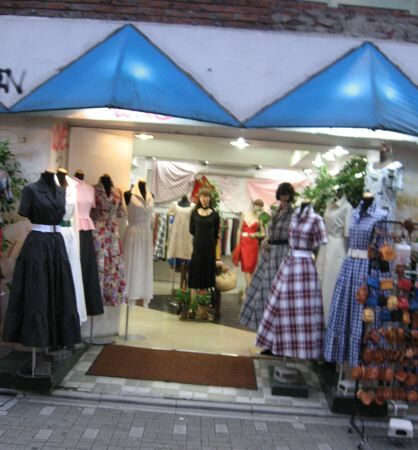 Varieties of pop music filled the air from each store, and the crowded street had a carnival vibe. Lotsa wild hair colors, costumes, tats, and piercings saunter by. Besides the many shops selling punk clothes, sports clothes, and cutesie girlie fashion layers, there was a store with conservative shirtwaist dresses typical of the 1950’s. Is it really hip to be square, AGAIN? Although, God knows, these women have the waistlines for that style! The only shop that lured me was an India import store. I guess I loved their handpainted staircase. But I continued to the train station, rode two trains for an hour and a half back to Zushi, took the bus from the Zushi train station to the bottom of the hill where Koki and Ayako live, and walked up to their house, well pleased that I am now able to get around on my own.